Exhilarating. Emotional. Exhausting. The 2014 Newport Folk Festival. I’ve had my doubts about the Newport Folk Festival over the last few years. It was mostly about me, and the strong feeling that the festival had passed me by as it seemed to be programmed for a younger crowd. That and the fact that a number of the acts that played were part of what I call the “faux folk” movement, which I think lacks any authenticity. I believe, as Louis Armstrong once said, that all music is folk music. So I don’t care what the sound is, just make it genuine. Convince me that you believe in what you’re doing. This year I decided to just put my concerns aside and just enjoy some good music at the beautiful Fort Adams venue that juts out into Narragansett Bay. There were still some faux folk groups around, but I simply avoided them and focused on music that appealed to me. As I result, it was my best festival experience in several years. There were some acts that appealed to younger audience, who are, after all, the future of this great event, but there was still plenty of good stuff for the rest of us. I’ve already seen some of the press coverage of the event. There are lots of “best things to happen at the Newport Folk Festival” stories custom built to appeal to the Internet’s lust for lists. If I was smart I would probably make my own list, but I think I’ll go with my human reaction to the music instead. I guess I’m destined to never go viral. First of all, you can’t see the whole thing, or at least I can’t. There are four stages (not counting the family stage), all going on all day for the three days of the festival. So I consulted the schedule beforehand via my nifty Newport Folk Festival app, and put a little star next to the acts that I wanted to see. Fortunately I left some room to catch a few acts that I wasn’t familiar with because it allowed me to have a couple of very nice surprises this year. The first surprise came early on Friday. I didn’t know the first thing about Reignwolf, but despite the fact that he has yet to release an album, there was a definite buzz about him. I had some free time, so off I went to the Quad Stage to check him out. I’d heard that Jordan “Reignwolf” Cook often performed solo, holding forth on electric guitar and beating a kick drum, but he had some help for his festival appearance, with a bass player and drummer joining in the ruckus. All music may be folk music, but Reignwolf stretches the definition of what most people think of as folk music. It was loud, it was heavy, it was certainly rock and roll, and I liked it. At some point I threw my head back and began laughing at the sheer exhilaration of it all. It’s hard to recall the last time I saw such a high-energy show that rocked from the first note to the last, but Jordan Cook is simply a force of nature. I look forward to his album, but it’s going to have a hard time rising to the energy level of his live show. The weekend got off to a good start on the Fort Stage, which is the festival’s main stage. I’ve admired the music of Anais Mitchell for several years now, but she was appearing in a new configuration with Jefferson Hamer. For the main part their set featured the duo harmonizing on several “Child Ballads,” which are traditional ballads from England and Scotland that were collected by Francis James Child in the second half of the 19th century. You might think this would make for pretty dry stuff, but the harmonies were beautiful, the songs were haunting, and it was clear that Mitchell and Hamer, making their first Newport Folk Festival appearance, took the folk thing very seriously. The highlight for me however was a stunning rendering of the title track from Mitchell’s wonderful 2012 album Young Man in America. Stream the full Anais Mitchell-Jefferson Hamer set at NPR Music. I was able to catch a part of Robert Hunter’s set on the Harbor Stage on Friday afternoon. The legendary Grateful Dead lyricist was accompanied only by his own acoustic guitar playing. His low-key, crowd pleasing set consisted almost entirely of Dead classics including “Dire Wolf,” “Bertha,” “Friend of the Devil,” “Sugaree,” and “Ripple.” The best moment for me, and one that will resonate with me for a long time, was Hunter’s emotionally devastating take on “Brokedown Palace.” Each year the Festival provides some unforgettable moments. That was one of them. 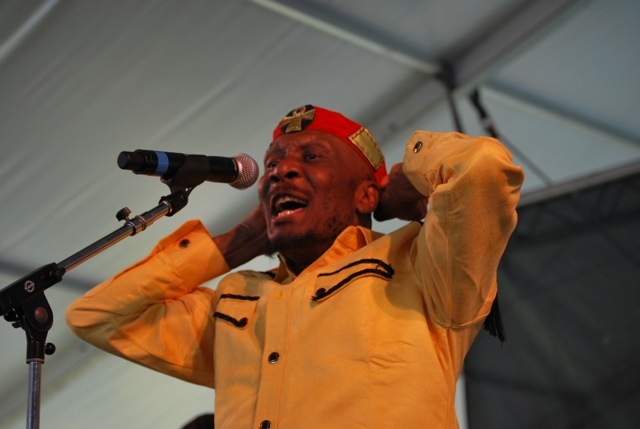 Before I knew it, it was time for Jimmy Cliff, one of the artists who I looked most forward to seeing this year. I was not disappointed. Cliff came charging out of the gate with a big band, and an energy level that you wouldn’t expect from a 66 year-old man. Highlights of Cliff’s strong, tight set included classics like “Rivers of Babylon,” “You Can Get It If You Really Want,” “Afghanistan,” a rewrite of his classic “Vietnam,” and of course “The Harder They Come.” Cliff’s emotional take on “Many Rivers To Cross” stood out for me.